A week of walks and activities to help you to discover the Canigou, ‘poc à poc’ (bit by bit). For the fifth year running, this free mountain festival offers you the opportunity to get to know Canigo. 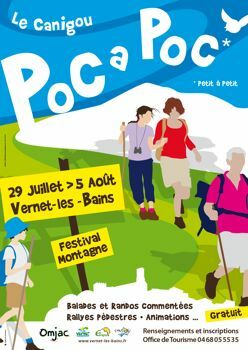 From July 27th to August 3rd, there will be walks, rallies, hikes and a variety of events to help you to discover the Canigou…..’poc à poc’, little by little. The activities have different levels of difficulty, with walks and trails available for families, nature lovers, more serious walkers, several with commentary and explanations of the surroundings. Along with picnics, games, visit of the Village Arboretum, concerts, nightime walk with story teller (bring torches) there is no better way to get to know the most sacred moutain of Catalonia. Of course, for the athletes amongst you, don’t forget the Canigou Race, if you really want to get that heart rate up!